Formerly the EX37, the 2014 Infiniti QX50 combines the aggressive styling of a premium sports sedan with the practicality of a crossover SUV. Available 19-inch, split five-spoke aluminum-alloy wheels not only elevate the QX50’s athletic stance, but also provide a touch of elegance to the already graceful exterior. 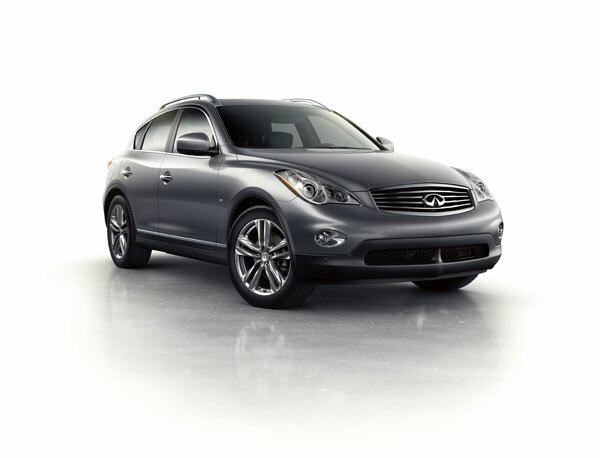 Each 2014 Infiniti QX50 is powered by a highly capable 3.7-liter V8 that pumps out 325 horsepower and 267 lb-ft of torque. The impressive engine is matched with a seven-speed automatic transmission, with quick shifts and steering-wheel paddles. The high-performing V8 under the hood of the 2014 Infiniti QX50 still manages to return up to 17 mpg city and 25 mpg highway. Premium materials and an innovative design scheme allow the interior of the 2014 QX50 to rival any luxury crossover, and it doesn’t skimp on standard technology, which includes dual-zone automatic climate control, eight-way power driver’s seat, a rearview monitor, sequential welcome lighting, and the Infiniti Intelligent Key. In addition to the rearview monitor, standard safety features on the 2014 Infiniti QX50 include stability and traction control, electronic brakeforce distribution, brake assist, and a comprehensive suite of airbags. There is also an engine immobilizer to thwart theft attempts. Pfeiffer Infiniti is proud to be the select Grand Rapids, Michigan area Infiniti dealer. We provide Infiniti vehicles, award winning service, and Infiniti parts to all surrounding areas including Kentwood and Wyoming. Our dealership carries an extensive line of new, used, and certified Infiniti cars and SUVs. Stop in today to view our large inventory or to have maintenance done on your Infiniti vehicle.